Our grandfather Roger Sheehy sensed a change 100 years ago when he opened the first Sheehy Funeral Home in a storefront at 76th St. and Halsted. People would prefer to have services outside of their own homes. Roger Sheehy listened. So did his sons, Roger, Jack and Bob. Now, a full century later, Roger’s grandsons Bob and Jim are still listening to the families their family has served for generations at 6 different Chicago Southside locations since the first storefront opened in 1913 during the William Taft administration. Bob and Jim operate funeral homes in Orland Park and Burbank and are the standard bearers for the Sheehy Funeral Home family. Locations have changed and the mission of the industry has expanded, but the one thing that has remained constant in the importance of listening to each and every person grieving a loved one who must take on the responsibility of making sure that the final goodbye is handled with care, compassion and professionalism. Bob and Jim Sheehy, along with their entire staff which includes five licensed funeral directors with combined experience of 85 years, promise that they will do everything down to the last detail to make this experience easier for families. Just like Roger did 100 years ago. For 3 generations the Sheehy Family has been there for families on Chicago’s southside and south suburbs. With 2 locations to serve families in Burbank and Orland Park, we continue to provide services in your time of need. We call it the “Sheehy Way”. 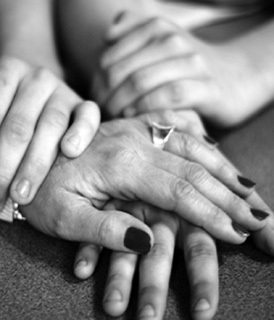 We developed a manner of service since 1913 that includes seeing to every need and concern a family has in preparing arrangements for their loved one. In celebrating the life of a loved one, families need to know we will handle every detail, big or small, so they are free to focus on meeting with family and friends who come to honor their loved one and comfort their family. There are literally hundreds of things that need to be addressed. Our mission is to address each and every concern and requirement from the beginning to the conclusion of the services a family chooses. We are here for Cremation services as well as pre-arrangement planning as well. In a hundred years you learn a lot about how to best serve a family in their greatest time of need. The Sheehy Way really means the most honorable and professional way we can possibly provide for you. Robert and James Sheehy are carrying on the tradition of their grandfather, Roger, their uncle Roger and father, Robert that started in a storefront at 76th St. and Halsted Ave. in 1913. This year marks the hundredth anniversary of the Sheehy family providing service to Chicago’s south side families. 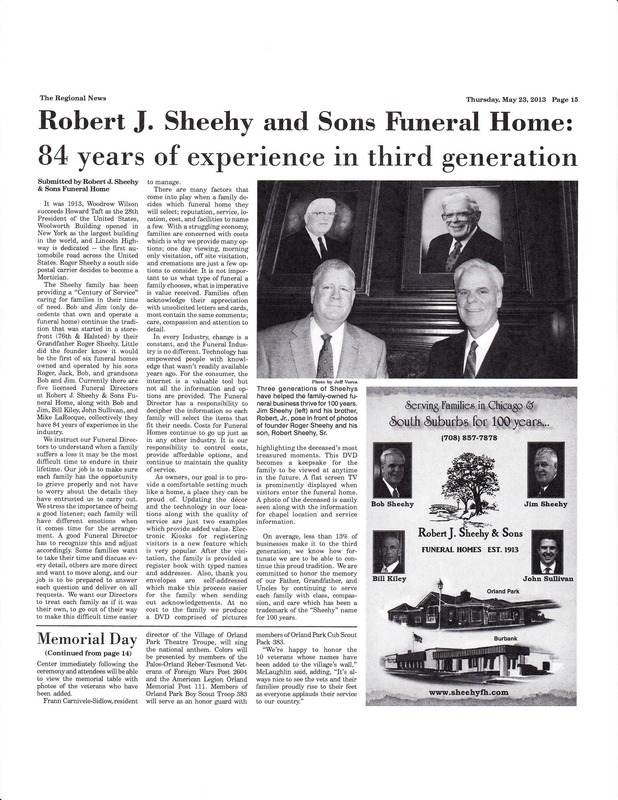 Continuing their tradition with funeral homes in Burbank, IL and Orland Park, IL, Bob and Jim Sheehy are the standard bearers of the Sheehy Family Funeral Homes in Chicago. 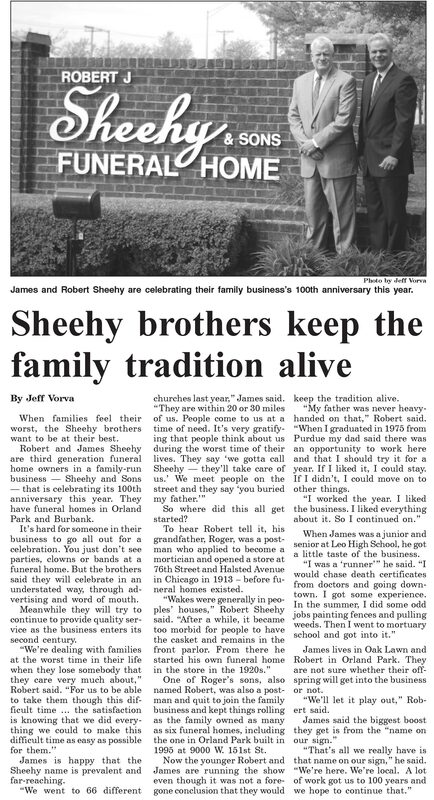 Jeff Vorva of The Regional News and The Reporter newspaper sat down to interview the Sheehy Brothers recently and filed this story documenting the Sheehy Family history in the funeral industry. The Southwest Suburban publication The Reporter published a very nice article about our family’s commitment to serving our communities. Most important to us is the article highlighting that our commitment today is the same as it has been for 3 generations of the Sheehy Family and a hundred years of continuous service to the families we have been privileged to serve. We thank every family who has entrusted us with caring for them and their loved ones during their time of need. We’re truly honored to be chosen to assist them. With 84 years of combined experience with our current staff of directors, we’ll continue to be there for families when they need us.